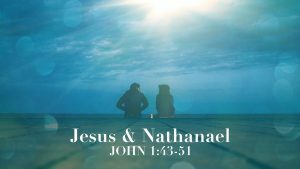 We record our messages each Sunday and can be streamed by clicking the links below or downloaded with the instructions below. To Play: Click on the play button under the title of the audio you want to listen to. Mac: Right click or Option + Click on the "download audio" link and then "save as". PC: Right click on the "download audio" link and then "save as". This was an incredible announcement then, and it is an incredible announcement to us today. God has redeemed his children! 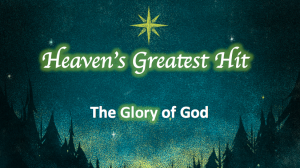 Today we will ponder the glory of God and why the angels were singing about it. 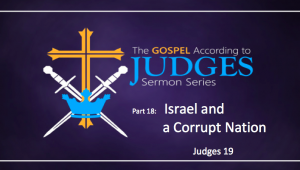 In Judges 21, we see the nation of Israel continue a downward spiral towards immorality, self-righteousness, and destruction. Although this is not a Christmas sermon, it does lead us effectively into the advent season. 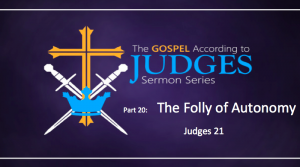 In Judges 20 we see the nation of Israel coming face-to-face with their sin. Although they try to do the right thing, it leads to civil was amongst the people of God. 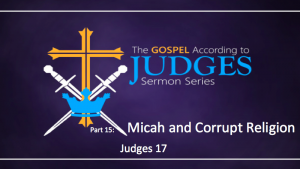 In this message, we see that Micah’s sin from Judges 17 spread to the tribe of Dan. 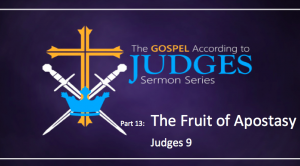 In this message, we enter the last portion of the Book of Judges. We will see that the last 5 chapters actually take place soon after the death of Joshua (the beginning of the time period of the judges) and show that the people of God had strayed mightily. 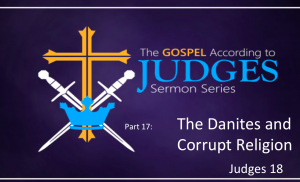 In Judges 17, we see how some Israelites corrupted their religion to meet thier own needs. In this message, we conclude or study of Samson. Despite his flaws, God uses Samson in a mighty way. In Judges 16, Samson meets Delilah and is captured by the Philistines. In the second part of Judges 15, Samson is betrayed by the very people he came to deliver. In Judges 15, Samson gets on the weary treadmill of retaliation. In Judges 14, we see Samson interacting with the Philistines. Samson will continually do things that may seem confusing– but pay attention to how God uses him. 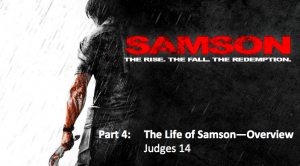 Before look at Samson’s life in detail, we shall try to understand the reason for his chaotic story. We will discover that Samson is a lot like us in many ways. We are taking a slight detour today. 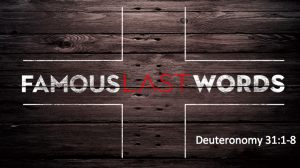 Instead of continuing in our series on the Book of Judges, we are looking at Deuteronomy 31:1-8. This Sunday we sent off our High School graduates– and this message is for them (and all of us) as we move into an unknown future. In Judges 13, we read about the birth of Samson. the story should sound somewhat familiar– and it has importance for us today. Samson is a very well known character in the Bible. His is a flawed hero that can teach us a lot about God and us. In the introduction, we will consider the people of Israel when Samson comes on to the scene. 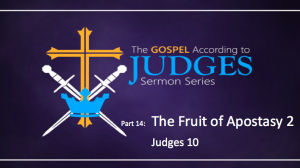 In Judges 11 we meet the next judge of Israel. 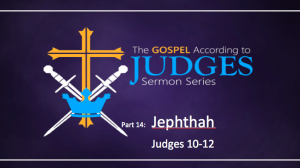 Jephthah is, again, an interesting and unlikely hero in Israel– one who learns a valuable lesson about making a vow to God. 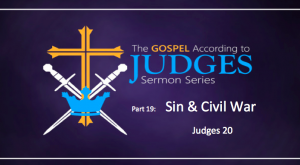 As we read Judges 10, we will feel the weight of sin and how it effects our relationship with God. 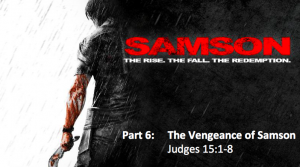 As we read Judges 9, we will feel the weight of sin, deceit, violence and revenge. It is not a pleasant story. Yet, it is in God’s Word. Why? I believe God wants us to understand the consequences of rejecting him- and he presents it in vivid detail in Judges 9.